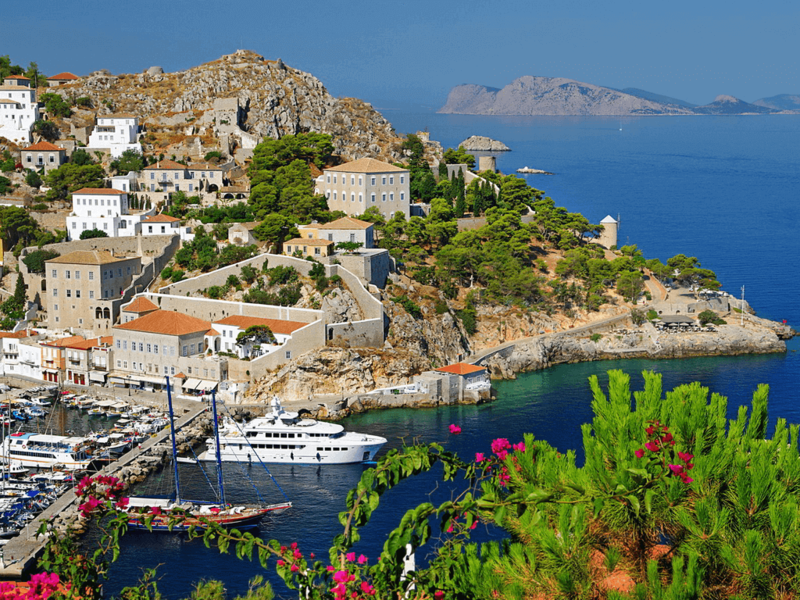 Frozen in time yet a top modern jet-setting hot spot, Hydra has not only managed to keep its legacy intact over the centuries, but has become a trendy destination in doing so. Its classic profile as the home of several shipping-magnate families hasn’t changed much, as it still enjoys an aristocratic following and sees many second and third-generation natives visiting large family mansions throughout the summer here. Fear not: everyday folk and travelers from all economic backgrounds are welcome here and sure to find something, (if not everything) to love about this island. The characteristic which stands out most about the island is the absence of motor vehicles, aside from a couple municipal garbage and service trucks. Anyone who is visiting the island after a stay in Athens is sure to appreciate the lack of traffic and noisy motorbikes! But Hydra is so much more than what it lacks. Magical stone mansions paired with cobbled alleyways under the quiet spell of time, transport visitors to another era and stir both the imagination and the desire to explore and wander around the town. Your wanderlust will pay off, as some of the island’s best seafood restaurants are tiny, unassuming venues tucked away into labyrinthine alleyways. The fact that you’ll be walking everywhere acts as an extra incentive to enjoy not only in the island’s well-known and revered cuisine, but also to indulge in its trademark sweet, almond marzipan known as “Amigdalota”. If the walks within the harbor and wider town area are intriguing, those into the island’s verdant countryside will not disappoint even the most seasoned explorers. With one of the most intricate and complex trail systems throughout the Greek isles, you could spend months before traversing them all. Hidden valleys, old goat farms, centuries-old monasteries and secret beaches are just some of what walks on Hydra have to offer. The most of the island’s numerous mansions have either been turned into museums or unique accommodation options, offering a high dose of authentic culture and class which is reflected throughout Hydra as a whole. It’s an ideal place for romantics, nature lovers, artists and old souls, regardless of what age you are. And situated just a three-hour boat ride from Athens, it’s the perfect excuse to escape the capital for an unforgettable getaway. It should come as no surprise that this island devoid of cars and other vehicles is a top hiking spot throughout the country. Its many diverse paths offer walkers of all abilities some of the best routes in Greece, particularly during spring and autumn. Along the way, the island’s beautiful scenery and rich flora can be enjoyed just about everywhere, be it along the coast, through the meadows or up in the mountains. Many flower species are endemic to the island and found nowhere else. The downside is that the path system is so intertwined and complicated, that finding your way around can be time-consuming and confusing. Many trails aren’t even included on most hiking maps, and other are misrepresented with either a complete lack of, or inaccurate signage. But this is also what makes walking so exhilarating here: hidden valleys and secret beaches pop up unexpectedly and new paths converge with the old so that you can never truly say you’ve seen it all. Thankfully, once you learn the three main trails, venturing off along the smaller, intersecting paths is much easier and enjoyable. This pristine beach lies in the northwestern section of the island, with pine trees surrounding its turquoise waters, and offering bathers calm and serenity. 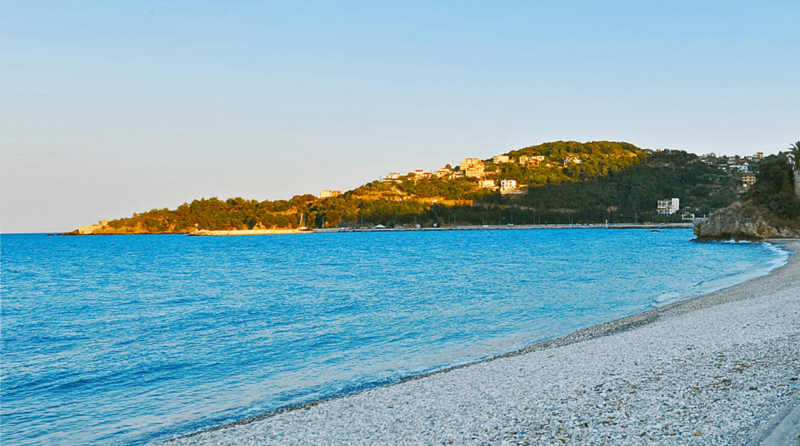 The beach of Limnioniza can be found along Hydra’s southeastern coast and can be reached by foot along a trail. It isn’t organized and doesn’t offer any natural shade, so bring an umbrella if you plan on staying a while. In the northeastern section Hydra, this beach offers bathers deep blue waters and blissful views of the opposite islet of Kivotos. Deep within a gulf just northwest of Hydra’s main harbor, this small beach is a great place to relax and enjoy its crystal clear waters. It’s right next to the Voulgari Mansion. The remnants of several castles and fortifications can be seen while exploring the island of Hydra. Some of these include the small castle aptly named “Kastraki” which dates back from the 17th century and stands along the island’s coastline. Continuing onward, the island’s former naval station and original harbor are found at a site known as “Mandraki”. They date back to the 16th and 18th century, respectively, and today have been turned into the Mira Mare Hotel. Along the way, the fortified structure known as “kastro” becomes visible. It dates back to the 16thcentury, though its present form is a result of reconstruction undergone during the years of the revolution of 1821. A remarkable number of wildflowers grow on Hydra, including several rare species. Common varieties to the island include daffodils, cyclamens, and poppies which dot the countryside along with cypress and pine trees, thyme and other bushes, as well as century-old olive trees. The olive and sage, have been held in high regard due to their nutritious properties down through millennia, and grow in abundance throughout Hydra. Aromatic Thyme leaves are made into a medicinal oil as well as used in various aromas. Without a doubt, the pine tree is the island’s most abundant plant, and it can be seen growing in various places throughout the island along with the cypress tree. Both are typically found along the limestone bluffs around Hydra. Hydra is home to several types of migratory as well as permanent bird species, including thrushes, turtle doves, quails and partridges. Several small mammals including wild hares and rabbits, the unique wild goat of Hydra and a large variety of amphibians and reptiles complete Hydra’s rich ecosystem.